You Have an e-reader and Still Want to Shop with Us ? No Problem. Did you or someone you know get an e-reader for the holiday? Third Place Books has partnered with Google to bring you the most flexible way to buy eBooks. From New York Times bestsellers to old favorites, Third Place Books now offers you one of the largest ebook collections available with Google eBooks. Shop for your next ebook and begin reading on just about any device. Google eBooks stores your library safely in the digital cloud, so you can read anywhere you go, using just about any device with an Internet connection. Google eBooks is compatible with most web browsers, Android phones, iPhone, iPad, and many eReaders. As you read, your page positions are saved across all the devices so you can pick up reading where you last left off. That means you can start reading on your PC, continue on your laptop, and carry on reading on your smartphone. Discover your next ebook among thousands of titles in every imaginable category. From bestsellers to classics, top fiction to up-and-coming authors, all ebooks now offer instant availability and free preview before you buy. Google eBooks allows you to enjoy unlimited storage of books in the digital cloud. 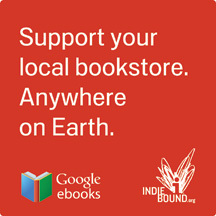 Support your local bookstore and shop with us, or at any of the Google eBooks retail locations. 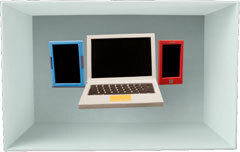 All your ebooks are stored wirelessly in one place, so you can access your library from one account anytime, anywhere. Going into the Holiday season each year our staff gets together to discuss some of our favorite reads of the year. We put together the results of this year's discussions and thought we would share them with our customers. 1. Matterhorn by Karl Marlantes - This novel about the Vietnam War inspired more passionate discussions amongst our staff and customers than almost any other book this year. It's a novel that is equally enjoyed by men and women. If you don't know what novel to give as a gift this year, look no further. 2. Crooked Letter, Crooked Letter by Tom Franklin - This literary mystery by an Edgar-award-winning author is a rich atmospheric novel set in Mississippi. 3. The Girl Who Kicked the Hornets Nest by Stieg Larsson - The third installment in this outstanding Swedish mystery series has kept fans satisfied this year. 4. C by Tom McCarthy - This is a dense anti-plot novel that is overflowing with codes, symbols, and secret messages. It's not for everyone, but fans of Pynchon will love it. 5. Skippy Dies by Paul Murray - It's hard to find really strong humorous fiction. This year the lives of students and teachers at an Irish boarding school provide the setting for one of the darkly-funniest novels of the year. 6. Dreadnought by Cheri Priest - Local author Cheri Priest's latest steampunk novel is a blast to read. It's captured the imagination of much of our staff and many customers. 7. The Lost Books of the Odyssey by Zachary Mason - A blending of the Borges literary legacy with Zoran Zivkovic’s mode of “mosaic novel” writing, The Lost Books of the Odyssey refracts the story of The Odyssey and the person of Odysseus down a long corridor of funhouse mirrors--44 chapters of jazzy improvisation. 8. The Lonely Polygamist by Brady Udall - This is an unlikely hero in an unlikely setting for an American family novel. But it surprises its readers with how much they empathize with all the characters in this tragic-comic novel. 9. The Passage by Justin Cronin - This post-apocalyptic thriller is the biggest page turner on this list both in size and how quickly you'll tear through it. The good news is that it's the first in a trilogy--there's more to come. 10. An Object of Beauty by Steve Martin - For those who haven't read Steve Martin's fiction, there are two things to know: these are not comic novels, and the guy can really write. This one, taking place in the world of art and art auctions, is a gorgeous book with color reproductions of some of the art described in the book. 1. The Tiger - by John Vaillant - This true account of a man-eating tiger in Russia in the 1990's is thrilling, extraordinarily well-written, and full of fascinating historical, cultural, and environmental research. 2. Were You Born on the Wrong Continent by Thomas Geoghegan - This in-depth look at German Social Democracy brings strong arguments for improving the general quality of life in this country by following their lead. 3. At Home by Bill Bryson - You couldn't ask for a better tour guide of how we live at home and the historical evolution of our domestic lives than the ever-inquisitive and always engaging Bill Bryson. 4. The Shallows by Nicholas Carr - This eyeopening and sobering look at the neurological consequences of how we live, work, and play with our computers and other devices is a fascinating read. 5. The Emperor of All Maladies by Siddhartha Mukherjee - Really good science books are hard to come by, great ones less so. This is one of the greats--a heartbreaking and inspiring book about the history of cancer. 6. The Possessed by Elif Batuman - For those who can't get enough of the great Russian novelists, you will find yourself in good company with the fun and insightful writing of Elif Batuman. 7. Hellhound on His Trail by Hampton Sides - This is an intense and chilling account of the assassination of Martin Luther King Jr., focusing on James Earl Ray and the greatest manhunt in US history. 8. The Wave by Susan Casey - As much a portrait of extreme surfing and the great Laird Hamilton as it is about the ocean waters, this book takes you up on 100-foot-tall rogue waves for a ride you won't forget. 9. What Ever Happened to Modernism by Gabriel Josipovici - This book coaxes out the inner lit-major in everyone. This is a strong, compelling argument that the way we look at the traditionally-acknowledged period of modernism in literature is all wrong. 10. Let's Take the Long Way Home by Gail Caldwell - This touching memoir about friendship, grief, and dogs is the kind of book you don't want to end. 1. Mockingjay by Suzanne Collins - This third and final installment in the Hunger Games trilogy did not disappoint its fans. 2. Adios Nirvana by Conrad Wesselhoeft - Set in and around the Seattle music scene, this powerful Young Adult novel wowed our Kids staff. 3. A Bedtime for Bear by Bonnie Becker - With rich language and fun characters, this is easily one of the most enjoyable books to read to young children published this year. 4. It's a Book by Lane Smith - While this is a picture book, it's clearly meant for older kids (7 & up) and maybe even more for adults. It's got one of the best punch lines you'll read this year. 5. Matched by Allyson Condie - So, you're bummed that the Hunger Games trilogy is over? Looking for what's next? You just found it. 6. Knuffle Bunny Free by Mo Willems - Possibly the best of the Knuffle Bunny books, this one had a few staff members tearing up at the end. 7. How Rocket Learned to Read by Tad Hills - This is a really charming little book that is perfect for kids who are just beginning to read or are trying to. 8. Countdown by Deborah Wiles - This story of a family during the Cuban Missile Crisis is filled with real-world documents and photos that make it a great and pain-free history lesson, as well as a gripping story. 9. Monsters of Men by Patrick Ness - Here another trilogy is wrapped up this year. The finale of the Chaos Walking trilogy is a thrilling novel of survival and the brutal realities of war. 10. My Life with the Lincolns by Gayle Brandies - If you are convinced that your family is the presidential Lincoln family reincarnated then you have one big task ahead of you--keep your father from being assassinated. The Seattle Children's theater recently put on a production of Where is the Green Sheep, based on the book by Mem Fox. We love this book, its the perfect book to share with a toddler. So imagine our excitement when we received a shipment of fluffy green sheep stuff animals! He is so cute we couldn't help playing a game of "Where is the Green Sheep" around the store. You can play too! Here we go! The Green Sheep loves children's books! He especially loves this display of Staff picks for toddlers to teens. To see the lists online, visit our website here. Here the Green Sheep is checking out all the great Christmas romances we have! Just look for the handy signs labeled "Christmas Romance!" Next the Green Sheep checked out the books in our Rare and Collectibles section. We have a great collection of Rare and Collectible books for the bibliophile in your life! Don't forget to get a gift for your favorite pet! We have catnip toys and these adorable stockings for dogs! What better way to get into the holiday spirit than enjoy hot apple cider while you decorate your home. The Green Sheep can't wait to try these new mulling spices. What ornaments does the Green Sheep decorate his tree with? Robot ornaments of course! We have all these and more! Let us help take the stress out of Christmas shopping. Our staff is ready to help you find the perfect gift for even the pickiest of readers. Want to check if we carry a book? Give us a call at 206-366-3333! If we don't have it we're happy to do whatever we can to track it down. Most books we can have in under a week. The Green Sheep is waiting by the phone for your call! Happy Holidays from Third Place Books.